Ok, NYC. You and I need to have a talk about this "creme" business. Why do you name almost all of your colors as cremes when they are really glitters,shimmers, or duochromes? I find this annoying, but I guess at $0.99 a bottle I cannot complain...but come on really???? Despite the faulty finish description, this is a gorgeous duochrome. 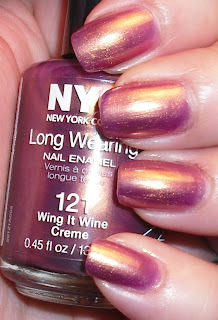 I admit NYC is probably my least favorite drugstore polish, but I'd consider this a winning polish along with Love Letter. This is a what I'd call a orchid color shimmer with a gorgeous golden pink duochrome. I'd say it's a purple, but more of a pink toned purple. I think this a great polish for fall and for a great price. It's not a must have, but definite nice addition to the collection. I actually have this color lying around somewhere? I had no idea it was as great as you swatched it. Thanks, I needed to know that. And I agree....why is everything named a creme with them? It's strange, the color combination sort of remind me of Bad Fairy from MAC's Venomous Villains-collection. Though this is sooort of cheaper! I still like Bad Fairy the best because of the texture and such, but I mean.. for $0.99? Awesome alternative. Haha. Random comment, but! I like the polish. I have not seen this anywhere. why? It is pretty I like it. Very pretty color, though I would definitely not call this a creme. Anyway...I have a color very similar to this (I think it's an Orly). Oh wow that's such a pretty shiny color. Love it! Definitely not a creme, but it's such a beautiful and unique colour! Wow. I've noticed the creme thing too. I'm wearing one their 'cremes' that is actually metallic, lol. Great color! Love it on your nails. LOL about NYC & the crazy mislabeled texture/finish descriptions. this looks like a close dupe for that pretty new MAC color everyone is raving over. Agreed, I usually buy NYC if I need a generic topcoat or something like that. Very pretty! I haven't seen it yet. Where did you find it? Lacquer- I don't know why everything is named creme by them! Makes me nutty! Sarah-I think the only similarity this has to Bad Fairy is the golden duochrome quality. Like you said the texture of Bad Fairy is different and the color is too, but Wing it Wine is still a nice shade. I'm glad you like it. MissMidnightBlue- I think I got this at Walmart. I also saw it at CVS other day. I haven't seen them at all CVS stores though. It probably is hit and miss. R., Jo, Beauty Addict, Katrina- Thanks! 1xeullus-I don't think it's a dupe of Bad Fairy, but it a nice shade. Bad Fairy has more of a foil texture and is more pink, but NYC color is still nice. rmcandle- I'm pretty sure I foundd this one at Walmart. I've also seen this one at some CVS stores, but not all. Samantha- It really is. I'm often disappointed with their formula and their selection, but everyone once in awhile I'll find a nice one. Very pretty - I love the duochrome! I do wish they didn't call their non-cremes cremes, though. Annoying. 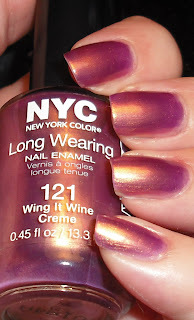 I just bought some NYC polishes at the Dollar Tree last night, they were in two packs, so only 50 cents each! Also, I found Sally Hansen Nail Prisms. So if you have a Dollar Tree or two or three nearby, you might want to head on over there and check it out!